- Wired network connection also possible. The Eminent EM6325 CamLine Pro Pan/Tilt HD IP Camera keeps a close eye on your belongings. The IP Camera is equipped with a HD sensor, IR cut filter and infrared LEDs for perfect images 24/7. 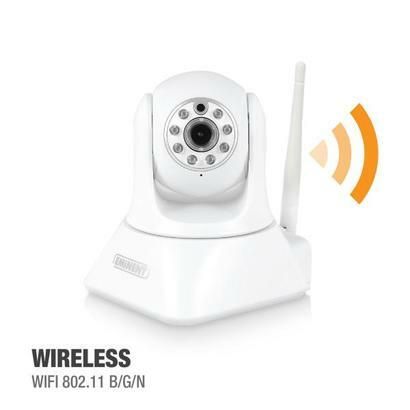 You can connect the PTZ camera within three steps to both your wired network or wireless network via WiFi Smart Config. Control the HD IP Camera from all over the world using the free CamLine Pro smartphone app. The camera will send a push notification or an email with a picture of the suspicious moment when the camera detects any movement. The images are recorded on a micro SD card or Synology NAS. Moreover, there are no subscription or monthly fees required. 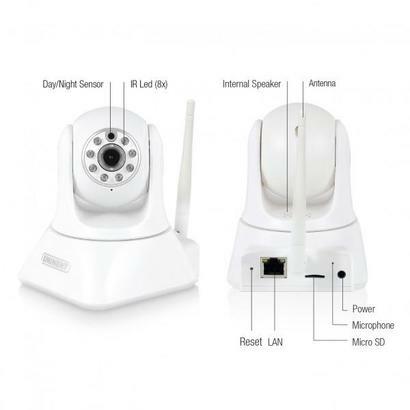 Install the EM6325 HD IP Camera within only 3 steps. 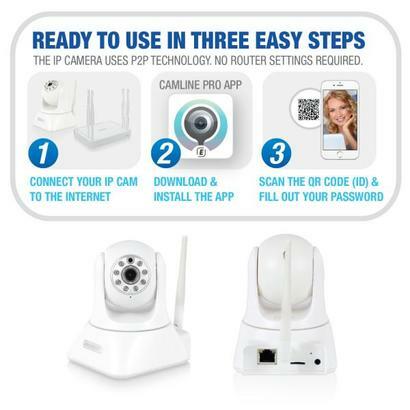 Connect the IP Camera to the Internet and download the free CamLine Pro Android/Apple smartphone app. Then, scan the unique camera code, fill out the password and you are ready to control the HD IP camera. Use the WiFi Smart Config function to connect the EM6325 easily to your wireless network. Open the app and wait for the sound to play from the camera. Lastly, fill out the password of your WiFi network. 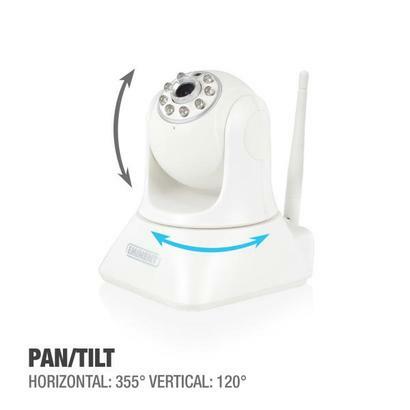 The EM6325 Pan/Tilt HD IP Camera is now connected with your wireless network. The built-in 720p HD sensor and IR cut filter ensure good images. Even at night. Is it too dark? The infrared LEDs will switch on automatically. The CamLine Pro HD IP Camera overlooks 360° thanks to the wide viewing angle of the lens, horizontal movement of 355° and vertical movement of 120°. Keep even a closer eye on your belongings with the 3 times digital zoom. Receive a push notification and/or an email with a picture of the suspicious event when the CamLine Pro Pan/Tilt HD IP Camera detects any movement. Insert easily a micro SD card into the camera and save all video images and pictures. Save the images on a FTP server or Synology NAS as the camera is listed in the Synology Surveillance Station. Curious about the activities at home? The EM6325 IP Camera has a two-way voice communication function as the camera is equipped with a built-in speaker and microphone. You are always up-to-date of all events in your home.